Nightfall is a deck-building card game by AEG (Alderac Entertainment Group). A digital version of the game is produced for iOS devices by Playdek Games and is available in the iTunes Store for $2.99. The game supports 2-4 players in local and online multiplayer, as well as single-player against 3 selectable levels of AI. The Nightfall Martial Law expansion is available as an in app purchase for $1.99 and multiple promo cards can be unlocked by playing and earning achievements. Nightfall is a deck-building card game in the same vein as games like Dominion, Ascension and Star Realms, but with several mechanics from trading card games like Magic and Yugioh thrown into the mix. Each player begins the game with the same deck of basic starter cards. Unlike most deck-builders the starter cards are discarded once they are played, eliminating the need for deck thinning. The starter cards are used to generate income to purchase better cards from a shared set of 8 stacks (multiple copies per stack), as well as 2 card stacks that are available only to each individual player (all of this is determined by a pre-game draft). The stacks of cards available for purchase are referred to in the game as the public and private "archives". 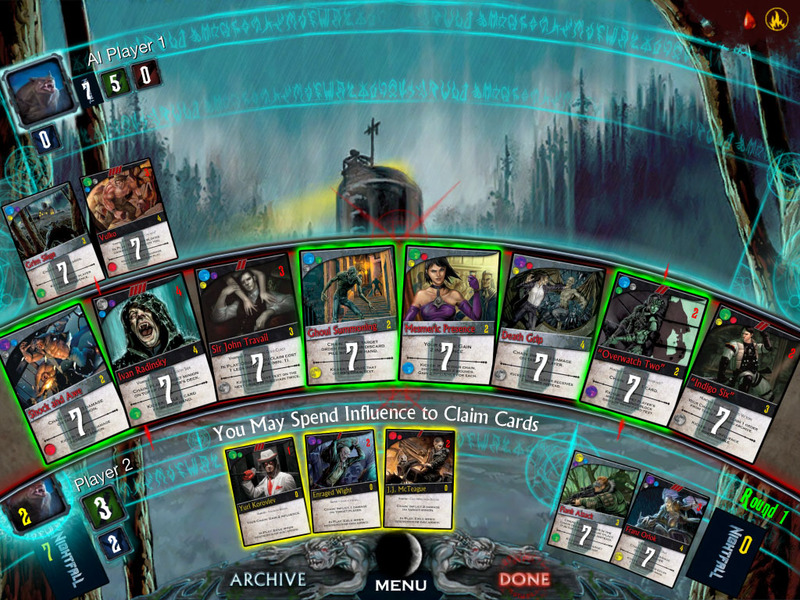 A player can play as many cards in a turn as can be chained together via a system of colored moons in the upper left of the cards. After a player plays his chain, the remaining players can then play any cards that they have that will fit in the chain, which is then resolved backwards, in a similar fashion to Magic or Yugioh. 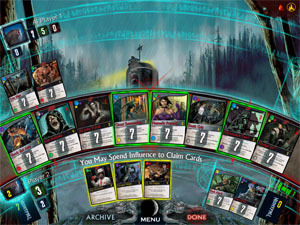 Quick action cards can be played during any player's turn, similar to spell cards in the aforementioned games. Minion cards once played stay out in front of the player to block or attack until destroyed, again similar to tcg's. These minions belong to four different distinct types, like the factions in a typical deck-builder; Vampires, Lycanthrope (Werewolves), Ghouls, and Hunters (Humans). These types can have effects on the way various cards interact in the game. 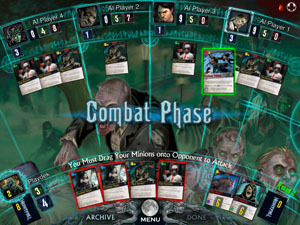 Nightfall is often sited as one of the first deck builders that featured direct attacking of opponents, where as some previous deck builders had been criticized as being "multiplayer solitaire", where each player is trying to out score the other and player interaction is relegated to trying to buy the cards the opponent wants from the shared trade row. In Nightfall the object is to get past your opponents minions with yours and damage him, forcing him to draw "wound cards", the player with the least of these at the end of the game wins. 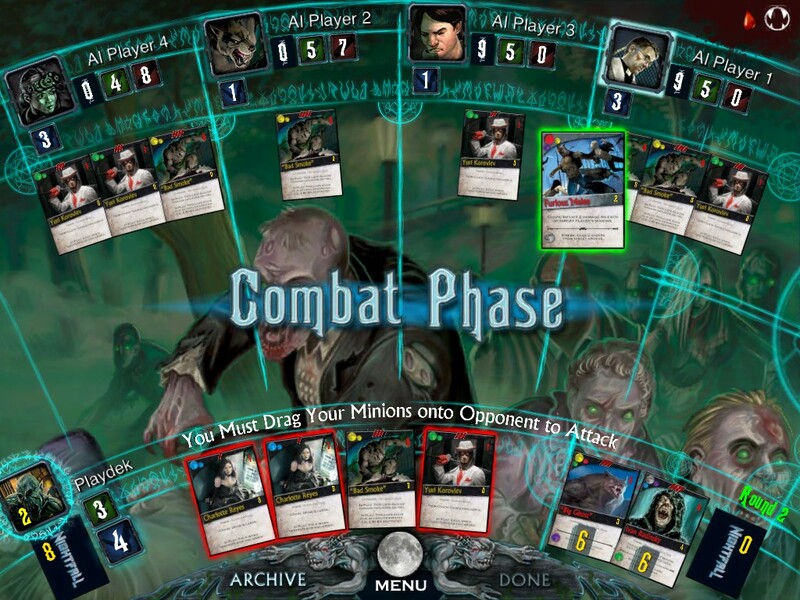 The digital app version of the game is extremely well produced, in the tradition of all of the card and board game conversions Playdek Games has made. The interface is elegant and does a great job of organizing a lot of moving parts. The game shines through the app by offloading some of the more fiddly aspects of the physical game onto the device's cpu. The game features a cool theme and some nice art which the digital version conveys quite vibrantly. The animations, music and various multimedia flourishes culminate into an atmospheric experience in line with the game's dark theme. Readers that are into tactical card games, deck-builders, tcg mechanics, or might be interested in a mash-up of all of these should give this one a look. The app is a bargain at the asking price and comes highly recommended.